There was a warm reception for the Revd Michael Simpson on 31 August at a service to welcome him to the Islington and Camden Circuit with members from all four of our churches present. 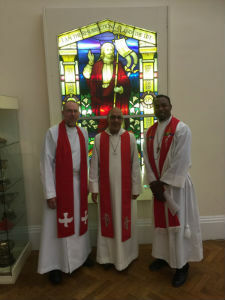 Leading the service were the District Chair, Revd Nigel Cowgill, and the Circuit Superintendent, Revd Tim Bradshaw. 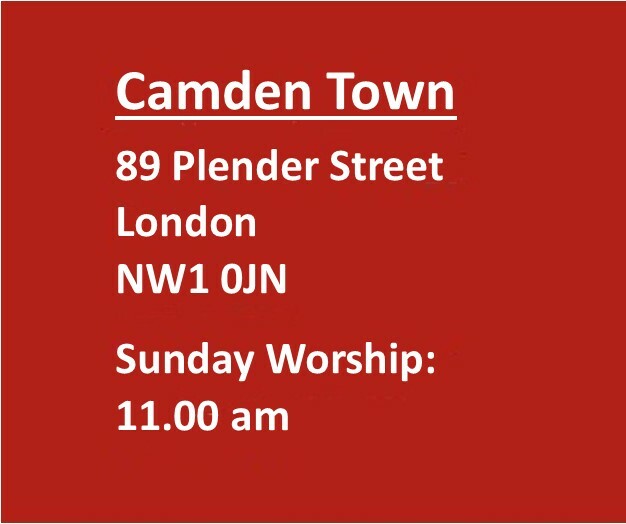 Michael will have pastoral responsibility for our churches at Caledonian Road and Camden Town. All the money that Second Chance makes is given away to charity. For the year 2014/15 they gave away £33,000; an increase on the amount that was given away last year. To international charities they gave a total of £7,000 to: All We Can, Freedom from Torture, Médecins Sans Frontières, Mercy Ships, Methodist Fund for World Mission, Open Doors UK, ORBIS, ROPE, Send a Cow and Smile Train. To national charities they gave a total of £13,500 to: Action for Children, Amelia Trust, Galloway's Society for the Blind, Hearing Dogs for the Deaf, Manna Society, Methodist Fund for Property, Methodist Homes, Methodist LWPT, Methodist Ministers' Housing Society and Auxiliary Fund, Methodist Mission in Britain Fund, Premier Radio, Prison Fellowship, The Salvation Army, Sisters of Mercy, Treloar Trust, UCB Radio. To local charities they gave a total of £12,500 to: 7th Tufnell Park Brownies and Guides, The Winter Shelter at Caledonian Road Methodist Church, CARIS, Centre 404, Freightliners Farm, Holloway Neighbourhood Group, Islington MIND, Marie Curie Hospice Hampstead, the North London Hospice, Pillion Trust, St John's Hospice, Sunnyside Community Gardens, Trussel Trust/Islington Food Bank, and UHFC Drop in. All the money that Second Chance makes is given away to charity. For the year 2013/14 they gave away £24,000. Where does the money go? Because they are an independent charity shop, owned by Archway Methodist Church, they decide where all of our profit goes. Their overheads are not huge, and they are able to support a lot of great work all over the world, but most importantly, in the community where the shop is sited, in Islington. Wherever possible, they offer support to those who need it most. This often means small charities for whom fundraising is particularly hard in the current economic climate, as well as larger charities who carry out vital work. To international charities they gave a total of £6,500 to: All We Can, Freedom from Torture, Médecins Sans Frontières, Mercy Ships, Methodist Fund for World Mission, Open Doors UK, ORBIS, ROPE, Send a Cow and Smile Train. To national charities they gave a total of £9,000 to: Action for Children, Amelia Trust, Galloway's Society for the Blind, Hearing Dogs for the Deaf, Manna Society, Methodist Fund for Property, Methodist Homes, Methodist LWPT, Methodist Ministers' Housing Society and Auxiliary Fund, Methodist Mission in Britain Fund, Premier Radio, Prison Fellowship, Sisters of Mercy, Treloar Trust, UCB Radio. To local charities they gave a total of £8,500 to: 7th Tufnell Park Brownies and Guides, CARIS, Freightliners Farm, Highbury Grove Crisis Project, Holloway Neighbourhood Group, Islington MIND, Islington Street Pastors, Marie Curie Hospice Hampstead, the North London Hospice, Pillion Trust, St Mary Magdalene Centre for Refugees and Asylum Seekers, Sunnyside Community Gardens, Trussel Trust/Islington Food Bank, and UHFC Drop in. On 23rd July members and friends gathered at Archway Methodist Church to bid a fond farewell to the Reverend Paul Weary and his wife Mary Ann. 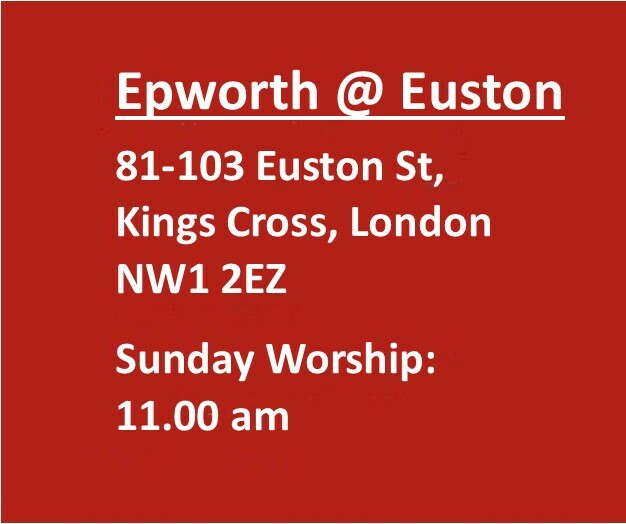 After 9 years' service as our Superintendent Minister, and Minister for Archway and Islington Central, Paul leaves us to continue his ministry in Walworth Methodist Church. The service was a real celebration of Paul's ministry to date. The Revd. Dr. Stuart Jordan led the service and his address, "Partners in Ministry" was based on Scripture passages taken from 1 Corinthians 3.5-11 and John 4.19-26. He spoke about partnership in ministry, drawing two main points from the readings. The first was that, as Christians, we are all partners in God's service. From the beginning, Paul's calling to ministry, has been a call to partnership. As his namesake St Paul puts it "only God gives the growth" (1 Corinthians 3.8) "we are God's servants, working together" (v9). Aptly, the church was filled with people who know or have worked with Paul from both inside and outside the Circuit - testimony of the partnerships Paul has made during his time here. The second point related to the Gospel passage from John., in which we learn that "God is spirit and those who worship him must worship him in spirit and truth" (John 4.24). As Jesus said to the Samaritan woman, "the hour is coming when you will worship the Father neither on this mountain nor in Jerusalem" (v21). From this we learn another aspect of partnership in ministry - it doesn't matter where we worship but how we worship because "true worshipers will worship in spirit and truth, for the Father seeks such as these to worship him". Again, this was beautifully illustrated by the congregation present at this celebration of ministry. 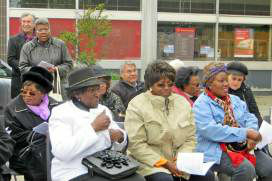 There were people representing different ecumenical backgrounds, organisations, cultures and traditions. The congregation, Paul and Mary Ann had the opportunity to bless each other with a litany of leaving. There were sung tributes to Paul and Mary Ann from the Archway choir and Sheena Narto. Ecumenical and circuit representativs paid their tributes and present gifts. The service was followed by a wonderful spread of food and refreshment! Paul and Mary Ann, Nathaniel and Sophie were wished well in their new venture and we pary that the Good Lord continues to guide them in all they do. 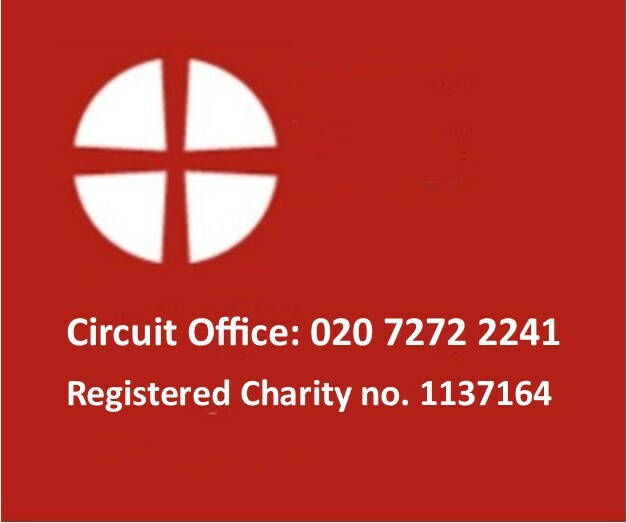 Over the years our circuit has developed particular traditions around the Paschal Triduum (the ‘Three Days’ from Maundy Thursday evening to Easter Sunday). 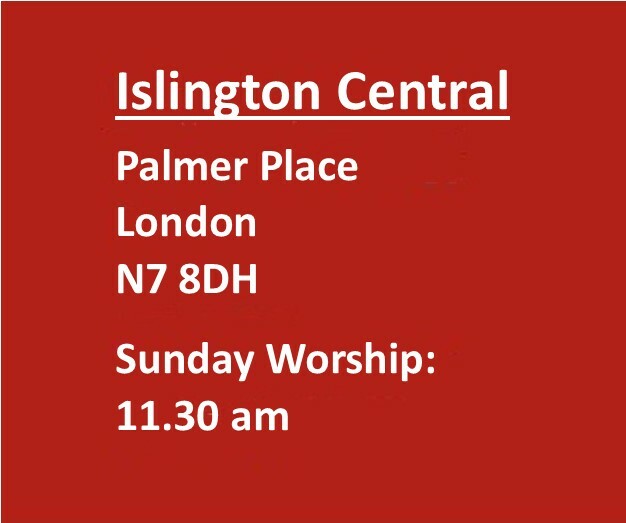 The circuit Maundy Thursday service at Islington began with a simple meal of soup and bread, followed by Holy Communion. The service came to a dramatic close with bible readings telling the story of Jesus’ arrest and trial. These were read in the manner of tenebrae, with the gradual extinguishing of candles until the church was left in darkness. 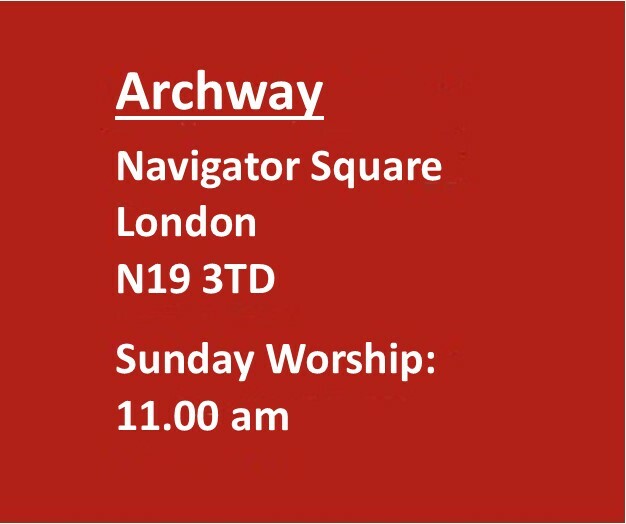 On Good Friday there were morning services at Archway and Caledonian Road, the latter led by Revd Dr Stuart Jordan, Chair of the London District. 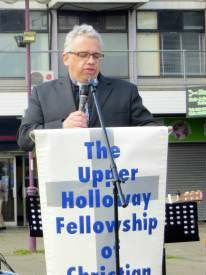 Many of the Archway members stayed on to the ecumenical service organised by the Upper Holloway Fellowship of Churches. 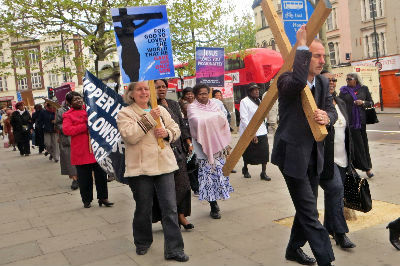 The more able bodied made their way to Upper Holloway Baptist Church for the walk of witness up Holloway Road. Those less mobile waited for the arrival of the walkers at Archway Mall (a grandiose name for the rather bleak pedestrianised area next to the Post Office) for the open air worship. This year the sermon was delivered by our Easter Sunday morning was celebrated in exuberant style across the circuit with the joyful singing of ‘Christ the Lord is risen today’. 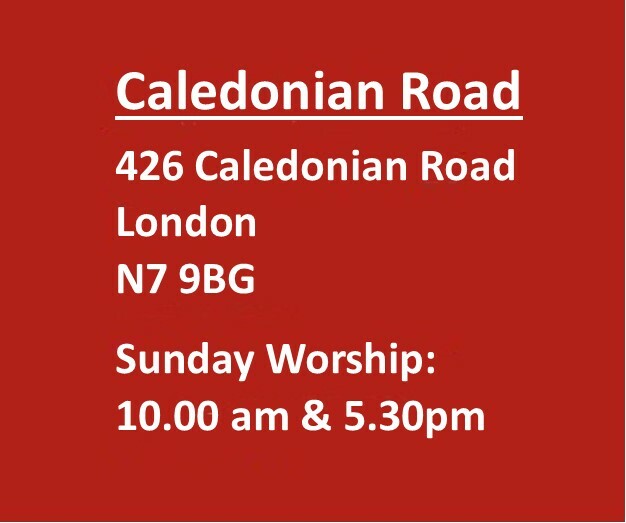 Evening worship was in a quieter key, as we met for café worship at Caledonian Road and explored together the theme of the Emmaus Road. 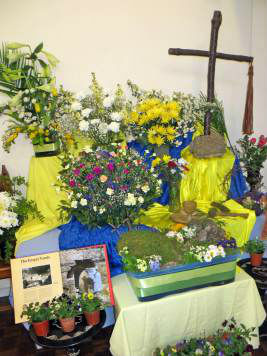 superintendent minister, Revd Paul Weary on the theme ‘What makes Good Friday good?’. 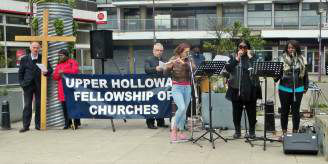 One of our younger members, Sheena Marfo, was one of the singers in the music group that accompanied the worship. Come risen Lord, as you came to your two disciples at Emmaus, and meet us in the opening of the scriptures and the breaking of bread. Jesus who was crucified…has been raised! Alleluia! The Gospel reading for this Easter Sunday can be one of two of the Gospel accounts of the Resurrection. Either Matthew’s (Matthew 28:1-10) or John’s (John 20:1-18). Matthew’s Gospel resurrection seems to be much more than Jesus being raised physically from dead. The resurrection of Jesus is not ‘just’ about defeating death, it is also about defeating exclusion, prejudice, injustice, hopelessness and inequality in the life before death. Hence, for Matthew’s Gospel resurrection seems to fit well with the Christian Aid slogan “We believe in life before death” or possibly a revised version “We believe in life before, during and after death”. Instead of defending resurrection how might it help if we invite others to suggest and defend alternatives? What experiences of resurrection have you seen? Where is resurrection most needed today? Who, where and how is God calling you to go quickly and tell of resurrection this Easter? The Weekly Bible Study is a prayer and worship resource available on the Methodist Church in Britain website. If you would like to read Revd. Warnock’s Bible notes in full, please click here.